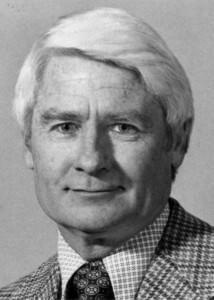 “The thing which impressed me about the article,” explained Chapter Director Bob Ewing, “was the importance of the physical records. Lots of people have anecdotes to relate about who did what and when, but to have actual physical evidence of the event years after it was over is something else again. A real human touch to the whole story. 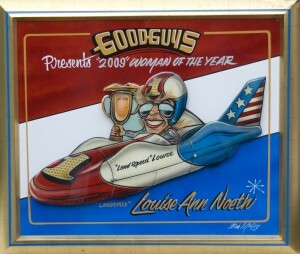 Columbus, OH – Renowned author, historian and columnist “Landspeed” Louise Ann Noeth was named 2009 Goodguys Woman of the Year at the 12th PPG Nationals in Columbus, Ohio. A veteran of motorsport and land speed racing journalism, she accepted the award in front of a packed house during the event awards ceremony. Noeth has fueled her passion for high speeds with a wide-ranging palate over several decades. After years of racing a 250mph jet dragster she joined Petersen Publishing Company in 1979. She was Petersen’s first female automotive editor-in-chief of any of the firm’s automotive publications. While working at Petersen, she produced Hot Rod Industry News, SEMA Show Daily, contributed to Hot Rod, Car Craft, Motor Trend and many specialty publications as well as serving on the development team for the Hot Rod Nationals and Car Craft Nationals. On the federal regulatory level, she has served on SEMA committee’s for tires, emissions and suspension helping protect enthusiast’s rights across the nation. In 1984, she founded Land Speed Productions offering a variety of creative disciplines including writing, photography, graphic design, PR and advertising. With her insatiable desire to write, photograph and talk about fast machines, she became active in the world of land speed racing in the 1990s teaming with Craig Breedlove’s “Spirit of America” streamliner. During his most recent land speed record run at Black Rock Desert in 1997, she covered the event for Sports Illustrated, USA Today, CAR&DRIVER, Chicago Tribune, London Daily Telegraph and CAR Magazine. In 2001 Noeth served as a crew member for Team Vesco’s “Turbinator” streamliner which set the current world land speed record for wheel-driven vehicles at 458MPH at the Bonneville Salt Flats. Most recently, she was team member of Steve Fossett’s world land speed record bid. 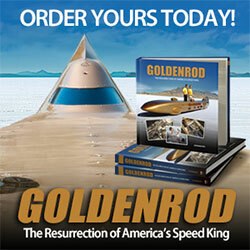 An accomplished author, Noeth wrote the definitive book on land speed racing, “Bonneville: The Fastest Place on Earth” (now in its seventh printing). In addition, she’s been a columnist focused on land speed racing for the last 20 years for a variety of publications including the popular “Fuel for Thought” appearing monthly in the Goodguys Goodtimes Gazette. When she’s not writing about land speed racing, she stays busy designing brochures, ads and logos as well as completing photo assignments for clients around the globe. 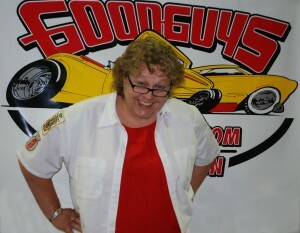 The Goodguys Woman of the Year award is presented annually in honor of the late Karen Bloechl (who was instrumental in the formative years of the Goodguys Association) and recognizes a female industry executive who serves to preserve the integrity and growth of the hot rodding industry. Past recipients of the Goodguys Woman of the year include: Margie Popp (1991), Ginny Lobeck (1992), Sue Brizio (1993), Maryann Harmon (1994), Karen Doe (1995), DeEtte Crow (1996), Jane Callison (1997), Gayle Stutts (1998), Judy Mullins (1999), Debbie Walls (2000), Jeannie Daly (2001), Donna Smith (2002), Debbie Lewis (2003), Jeanette Ladina (2004), Joyce Smith (2005), Barb Davison (2006), Stacy Tucker (2007) and Lynn Nace (2008).